Fabric-covered buttons add dressmaker style to pillows, upholstery, and other home textiles, and they're a great way to use fabric samples and scraps. Most craft stores sell button-covering kits, but it's almost as easy to make fabric-covered buttons without one. It definitely costs less. This also allows you to exactly match the button fabric with that used in the project itself. You can also make contrasting buttons in a different fabric color or texture. The time required varies by the number of buttons you're covering and by the fabric you choose. Prints with a pattern you have to center take longer than solids. Set aside enough time so you can get the effects that you need and your buttons match well. Turn a round, shank-style button upside down on a piece of pasteboard. Trace around the button with a pencil to make a template. On the back of the button, measure from the shank to the edge. Draw a second circle that much larger all around than the first, with the first circle centered inside it. Cut out the template along the lines of the larger circle. Cut through the one side of the larger circle, and then cut out the smaller circle like a doughnut hole. Tape the cut in the side of the larger circle. Place your template on a piece of batting. Trace the inner circle with a pencil, and cut it out. Brush adhesive on the front of the button, and affix the batting. Let the adhesive dry. Lay your button fabric right side up, and place the template on top of it. Move the template around, until you like the look of the fabric centered within the doughnut-style hole. That's how the fabric will look on your finished button. Trace around the outer edge of the template with a pencil, and cut out the circle of fabric. Lay your circle of fabric right side down, and place the template on top of it. Trace the inner circle with pencil. Thread a hand-sewing needle with heavy-duty thread that matches your button fabric, but don't knot it. Run a loose basting stitch all around the circle, 3/8 of an inch from the edge. Leave the thread end loose once you reach your starting point. Place the circle of fabric right side down. Turn the button upside down on top of it. Align the button with the penciled circle on the fabric. Pull the thread from both ends to cinch the fabric over the back of the button. Pull the threads tight, and then knot them. Cut off the extra thread. 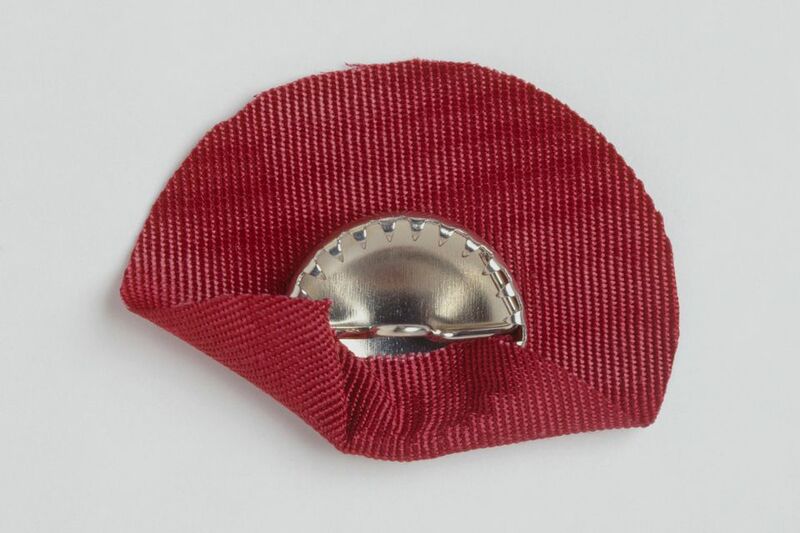 If your button fabric tends to ravel, zigzag around the edge with your sewing machine. Alternatively, apply white craft glue to the edge with a small paintbrush. Brush the craft glue on both sides of the fabric.